Wed, Jul 11, 2018, 10:29 pm SL Time, ColomboPage News Desk, Sri Lanka. July 11, Colombo: Sri Lanka today launched the long-term development plan for the Eastern port city of Trincomalee and surrounding cities in the island's Eastern Province. 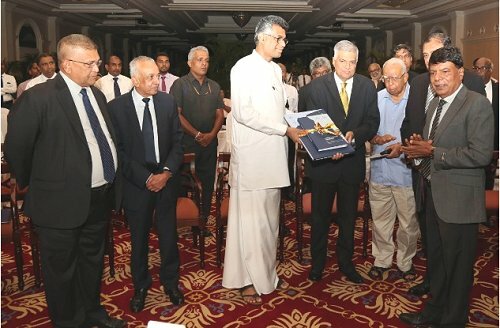 The long-term plan to develop the port city under the theme "Eastern gateway to Sri Lanka by 2050" was presented to the Prime Minister Ranil Wickremesinghe today at Temple Trees. The program for transforming Sri Lanka into the hub of the Indian Ocean was launched with the handing over of the Trincomalee District Mega Development Plan, which expects to expand Trincomalee as a center for exports, tourism and leisure, to Singapore infrastructure consultancy Surbana Jurong today. Under this project, Trincomalee will be developed as the main export center for the Bay of Bengal region with eco-friendly industrial zones, agricultural zones and tourism. Highways, transport, education, health and other facilities are planned to be built and it is envisaged to generate more than a million new jobs. Surbana Jurong in June 2016 signed a MOU with the Government of Sri Lanka to develop 1,363 sq km of Trincomalee Metro Area to become a resilient economic hub in Sri Lanka and the preparations of the grand expansion plan was initiated in November 2016. According to Surbana Jurong Trincomalee's strategic location allows it to be developed as hub for commerce, agriculture, fisheries, food industries and tourism. Speaking at the event, Prime Minister Ranil Wickremesinghe noted that when Sri Lanka was the focal point of the Indian Ocean in the ancient times, there were a number of ports in the island's east and west. "At the present time, when considering the economic development of the Indian Ocean, the Colombo Port as well as the Hambantota Port will earn a special place. And countries such as India, Pakistan and Iran will also be important. We hope to earn more economic benefits by providing services to ships navigating through Suez Canal to Singapore," the Prime Minister said. "By the year 2050, the population in the Bay of Bengal region will be about three billion, and then there will be great improvements. By that time, we need to develop Trincomalee as the Eastern Gateway to Sri Lanka," he emphasized. He said when this government came to power in 2015 the goal was to develop the entire country and the government focused mainly on development in the Western Province since the development of the country depends on Western Province. "We also began work on the development of the coastal belt of the country and the construction of the Colombo-Kandy highway and the development of this area. While we did this, we did not forget the rest of the country," the Premier explained. "We have received assistance from Asian Development Bank to extend development to Trincomalee based on the Western and Eastern economic corridors of Sri Lanka, Construction of the highway from Kandy to Trincomalee and for the development of Trincomalee through the Surbana Jurong plan prepared according to the reports we provided," he said. The Trincomalee development plan has included plans for Sri Lanka for the next 10 to 15 years, the Premier said. "This will build on the strong progress we have already made across the country to drive economic and social development so that we can improve people�s lives and give our children a future," he said. Ministers Champika Ranawaka and Malik Samarawickrema, Opposition Leader R. Sampanthan, Governor of Eastern Province Rohitha Bogollagama, and representatives of Surbana Jurong were also present at the occasion.